President Donald Trump's border wall prototype project cost the San Diego County Sheriff's Department (SDSO) more than $700,000 in overtime pay, the department told NBC 7 on Thursday. In a records request to the county, NBC 7 learned the Trump Administration's proposed border wall prototypes project cost the county $1,613,112.38. Of that total, the Sheriff's Department spent $1,429,831. The records request also said SDSO staff worked roughly 10,000 overtime hours at an estimated cost of $761,000. Money for SDSO staffing comes from the department's routine operations department, SDSO spokesperson Director Lt. Karen Stubkjaer said. Stubkjaer said the department did not create any extra jobs as a result of the project and stressed the cost has not impacted regular patrols. "The cost associated with staffing for the Sheriff's Department has not impeded routine operations or jeopardized the safety of the community," Lt. Stubkjaer said. 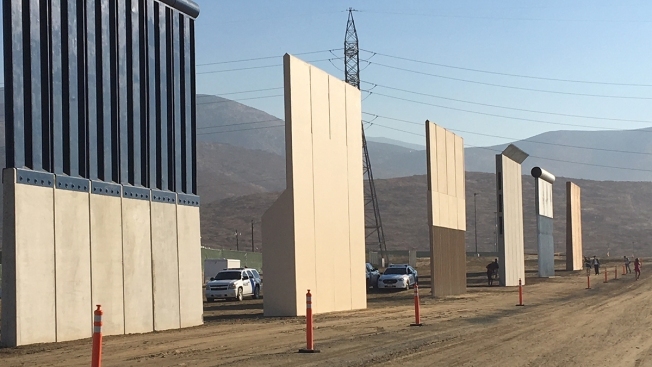 In January, NBC 7 learned the border wall prototype project cost the San Diego Police Department (SDPD) about $278,000 in overtime and other expenses for patrol in Otay Mesa. Since his candidacy, President Donald Trump has promised to build a border wall. In late September, the administration began constructing eight prototypes in Otay Mesa.